Gain complete visibility into your production schedule with the flexibility needed to avoid bottlenecks, minimize downtime, and meet your customers’ scheduling demands. 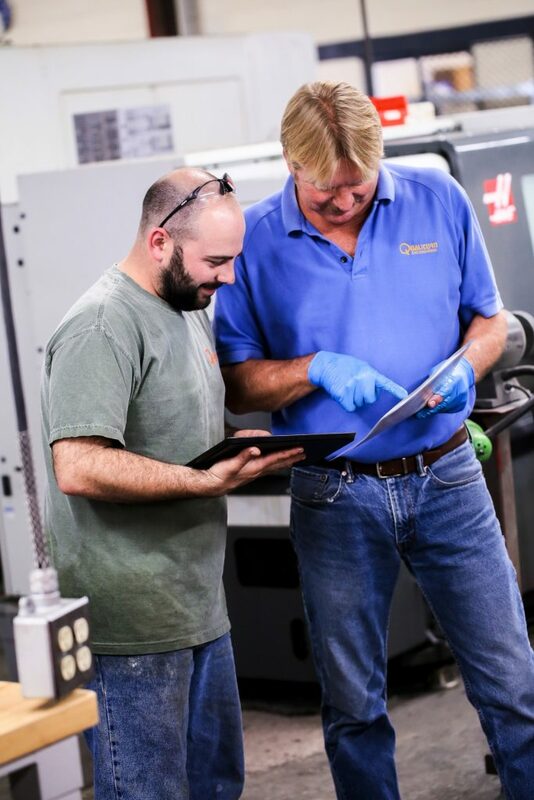 The job schedule is at the heart of any manufacturing shop. It governs how jobs flow through your production process, which impacts your on-time delivery rates, efficiency, customer satisfaction, and ultimately your bottom line. Without transparency into your schedule, it’s difficult to manage resources and anticipate challenges. Bottlenecks arise out of nowhere. Team members have excessive downtime at their stations while they await jobs. You have labor shortages on certain shifts because you didn’t schedule properly. Any number of costly difficulties can arise when you lack visibility into your schedule. E2’s robust Scheduling Module delivers not only complete visibility, but also the tools and flexibility needed to make fast, informed production decisions. Create your production schedule based on known data, not best-effort estimates. Predict risks and possible bottlenecks, and reallocate resources to minimize production interference. Take full control of your schedule to transform your shop floor into an efficient, finely-tuned machine. Proactively work to minimize production schedule challenges. Perhaps the most powerful component of the scheduling module is the way in which it processes and displays information, allowing you to take quick action to prevent downtime and bottlenecks. No more surprise production delays. With E2, you see them before they arise and you have the tools to take preventative action. Quickly designate high priorities and critical importance to jobs so you can reroute work to meet tight deadlines. Use planned jobs and a What-If Simulator to predict scheduling challenges and material requirements. Plug in machine downtime, missed employee shifts, and other unexpected challenges to adjust and rework the schedule. Use drag-and-drop technology to quickly move jobs to different work centers, shifts, employees, and more. Monitor capacity and floor workload and make on-the-fly changes as needed. The E2 Scheduling Module puts you in charge of your shop’s workflow. Don’t let challenges and bottlenecks take you by surprise. Take back control of your shop and your schedule. Contact Shoptech today. Our team of E2 consultants welcomes the opportunity to learn about your goals and needs and help you develop a strategy. View your production schedule in real time. The Whiteboard is the epicenter of the Scheduling Module. With just a few clicks, you can access the Whiteboard and see all inputs, needs, objectives, and more related to your planned and in-progress jobs. Sort Whiteboard data by day, workstation, job number, timeline, and more. View exceptions and potential challenges to make informed decisions about employee and resource management. Highlight and prioritize jobs that are late or scheduled to be late, or those that are still missing key materials. Create a wide range of schedules and distinguish them by shift, department, job, and more. Stack jobs-in-progress side-by-side so you can measure efficiency and performance.